(Nanowerk News) Researchers have developed a novel technique for crafting nanometer-scale necklaces based on tiny star-like structures threaded onto a polymeric backbone. The technique could provide a new way to produce hybrid organic-inorganic shish kebab structures from semiconducting, magnetic, ferroelectric and other materials that may afford useful nanoscale properties. The researchers have so far made nano-necklaces with up to 55 nanodisks. 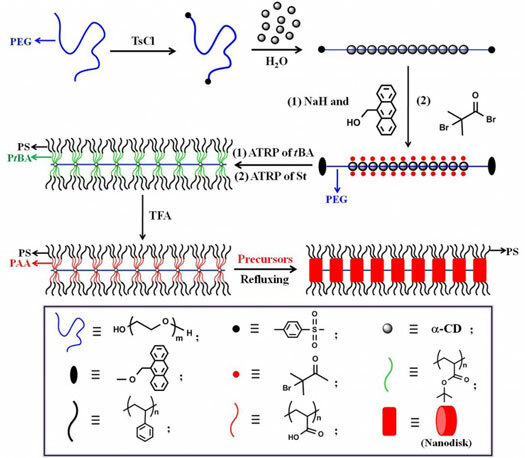 The template-based process grows amphiphilic worm-like diblock copolymers through a living polymerization technique in which the polymeric structures serve as nanoreactors that form laterally connecting nanocrystalline structures based on a variety of precursor materials. The nanodisks average about ten nanometers in diameter and four nanometers in thickness, and are about two nanometers apart. The research was supported by the Air Force Office of Scientific Research and the National Science Foundation. The results were published on March 27 in the journal Science Advances ("A General Route to Nanocrystal Kebabs Periodically Assembled on Stretched Flexible Polymer Shish"). The one-dimensional nano-necklaces could have optical, electronic, optoelectronic, sensing and magnetic applications. The researchers have so far produced structures from cadmium selenide (CdSe), barium titanate (BaTiO3) and iron oxide (Fe3O4), but believe many other materials – including gold—could also be used. The technique begins with formation of inclusion complexes made of alpha-cyclodextrins, cyclic oligosaccharides composed of six glucose units. The alpha-cyclodextrins, which are hollow in the center, thread themselves onto a polyethylene glycol (PEG) chain in an established self-assembly process. The polymer backbone on which the alpha-cyclodextrins are threaded is capped by a larger stoppering agent to retain the tiny structures. Each alpha-cyclodextrin has 18 hydroxyl (OH) groups that can be converted into bromine (Br) groups through an esterification process. Diblock polymer “nanoworm” structures are then grown from these bromine groups in solution. Formed from poly(acrylic acid)-block polystyrene (PAA-b-PS), the worm-like diblock copolymers are made up of inner poly(acrylic acid) (PAA) blocks that are hydrophilic, and outer polystyrene (PS) blocks that are hydrophobic. Because so many diblocks grow on each alpha-cyclodextrin, their crowding stretches the polymer backbone. Finally, metallic ion precursors are preferentially incorporated into the space occupied by inner PAA blocks of worm-like diblock copolymer nanoreactors, forming crystals. These crystals connect the once separate structures, creating the nano-necklaces – which resemble tiny centipedes. Transmission electron microscope images clearly show the nanodisk-like kebabs because they are made up of materials with high electron densities. However, the connecting PEG shish doesn’t show up because it is a single chain and its electron density is much less. Formation of the structures was initially surprising to Lin’s research group, which expected to produce structures resembling nanorods or nanowires. But simulations done by team member Yuci Xu at Ningbo University in China confirmed formation of the structures they were observing experimentally. The simulations also allowed prediction of the structural dimensions that would be produced. With their growth technique demonstrated, the researchers now want to characterize the tiny structures and establish potential applications. Though these have not yet been studied, Lin believes the structures, which are based on semiconducting materials, could, for instance, have electronic applications, with electrons tunneling through adjacent nanodisks. 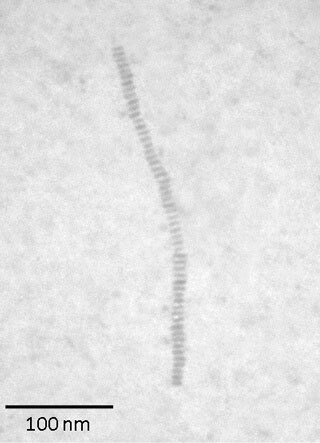 Other techniques exist to form nano-necklace structures, but none uses a similar template and nanoreactor approach, Lin said. In future work, Lin’s group plans to examine the properties of the structures they’ve built, test other potential materials, and examine applications that may be appropriate. While the properties of individual nanodisks have been studied before, their collective interactions may provide some potentially unique properties.